Southeast Asia Studies, established at Yale in the 1940s, was the University’s first area studies program of any kind, and it had a strong foundation. In addition to its distinctive language courses (Burmese, Indonesian, “Siamese,” Tagalog and Vietnamese), the University had developed a superb library collection on Southeast Asia, much of it acquired from as early as 1899 when Clive Day (1871-1951), the first American historian of Indonesia, joined the Yale faculty. He published The Dutch in Java in 1904, and taught at the University until his retirement in 1936. Between 1932 and 1949, the sociologist and anthropologist Raymond Kennedy (1906-50), the “founding father” of Southeast Asia Studies at Yale, was a “one-man center” of new scholarship and teaching on the region. He conducted fieldwork in Indonesia and the Philippines, and published “Bark Cloth in Indonesia” (1934), Ethnology of the Greater Sunda Islands (1935), and Islands and Peoples of the Indies (1943). Beginning with work on the collection of books on Indonesia already in Yale Library, he also assisted in assembling data on Southeast Asia for the Yale Cross Cultural Survey; and compiled an extensive bibliography on the peoples and cultures of Indonesia, which he published in 1945. 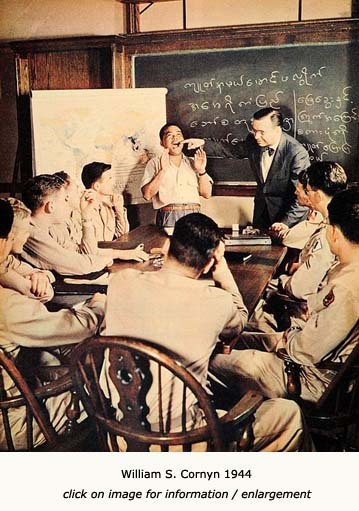 A program in Southeast Asia Studies was initiated at Yale during World War II, in response to a call for language and area studies for military personnel. Professors William S. Cornyn (1906–71) and Isidore Dyen (1913-2008), linguistic scholars in Burmese and Malayo-Polynesian respectively, developed a set of language courses for the Army Specialized Training Program. The army training program ended with the war, but the University, in response to the “driving force” of Raymond Kennedy, and recognizing that the increasing importance of Southeast Asia in world affairs had created the need for a pool of scholars and specialists who could understand and interpret the area, moved forward to strengthen its offerings on Southeast Asia. In 1947, with the aid of the Carnegie Corporation, an interdisciplinary Southeast Asia Studies area studies program (which eventually included a masters degree and an undergraduate major) was incorporated into the curriculum of the liberal arts and sciences. 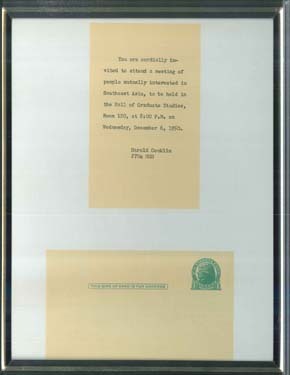 The program was reputedly the first of its kind in the country. Funds from the Carnegie grant were used for development and hiring as well as to support field research and publications. It was during this period that Southeast Asia scholars Karl Pelzer (1909-80), Paul Mus (1902-69), and John Embree (1908-50) joined the Yale faculty. Tragically, Embree and Raymond Kennedy were both killed in 1950 - Kennedy in an ambush in Java, where he was doing research, and Embree in an automobile accident in New Haven. From 1958-1971, through the turbulent years of the Vietnam War, the Ford Foundation along with the U.S. government, contributed several grants aimed at expansion of the program, ultimately including an endowment created by the Ford Foundation which is still in existence today. During this time, historian Harry J. Benda (1919-71) is remembered for (among other things) his central role in establishing a strong graduate program at Yale. He also played an important role in stimulating research among scholars from the countries of Southeast Asia, helping several of them to pursue their studies and research at Yale, and also enlarging the opportunities for others to carry out research in Southeast Asia itself. The outstanding example of this effort was in Singapore, with the successful launching of the Institute of Southeast Asian Studies (ISEAS), of which Benda was the first director. In 1977 the Southeast Asia Council of the U.S. Association for Asian Studies (AAS) instituted the prestigious Harry J. Benda Prize, to “recognize outstanding contributions to the field of knowledge about Southeast Asia. The award comes from a fund consisting of contributions from 270 individuals all over the world - many of whom were personal friends, colleagues, or students of Harry Benda - as well as generous contributions from Yale and Cornell Universities and the Lee Foundation in Singapore. And Benda is remembered for founding and editing Yale’s Southeast Asia Monograph series in 1960, publishing its first 16 volumes before his untimely death in September, 1971. By 2012 this still active Series included 62 volumes. Four earlier series of Cultural Reports, Bibliographies, Translations, and “Special Publications,” appeared between 1950 and 1969, comprising a further 40 volumes on Southeast Asia. Geographer Karl J. Pelzer served as director of Southeast Asia Studies from the late 1960’s until his retirement in 1977. The Southeast Asia masters degree and most of the language courses were discontinued in 1972, as outside funding became less available. During the 1980’s Council chair James C. Scott acquired a series of grants from the Henry R. Luce Foundation, one of which served as seed money for Vietnamese translator and editor Huynh Sanh Thong to launch the Vietnamese Refugee Project, which culminated in the Lac-Viet, Vietnam Forum, and Hmong World publications series and produced 29 volumes of Vietnamese literature and scholarship from 1983-1990. From 1993-1997, another 6 volumes were published under the editorship of Dan Duffy, underwritten by a grant from the Ford Foundation. Luce Foundation funds contributed toward substantial growth in library acquisitions under longstanding Southeast Asia Collection Curator Charles R. Bryant, as well as funding faculty hiring and the teaching of Indonesian, and providing research support for graduate students pursuing studies on Southeast Asia.